Has FX taken another bite of the Big Apple? Is the Pose TV show cancelled or renewed for a second season on FX? The television vulture is watching all the latest cancellation and renewal news, so this page is the place to track the status of Pose season two. Bookmark it, or subscribe for the latest updates. Remember, the television vulture is watching your shows. Are you? 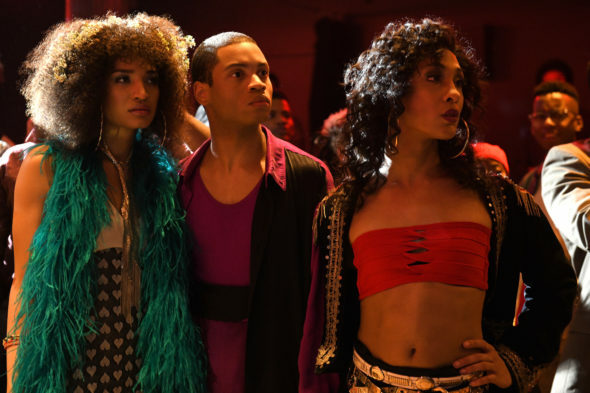 An FX musical dance drama, Pose features the largest cast of transgender actors in series regular roles, as well as the largest recurring cast of LGBTQ actors in a scripted drama. The series stars Evan Peters, Kate Mara, James Van Der Beek, MJ Rodriguez, Dominique Jackson, Indya Moore, Hailie Sahar, Angelica Ross, Billy Porter, Charlayne Woodard, Ryan Jamaal Swain, Angel Bismark Curiel, and Dyllón Burnside. It revolves around several segments of society in New York City in the 1980s — ball subculture, Trump-era excess, and the downtown social and literary scenes, as it explores people on various walks of life. The first season of Pose on FX averaged a 0.25 rating in the 18-49 demographic and 645,000 viewers. Find out how Pose stacks up against the other FX TV shows. Pose has been renewed for a second season which will debut June 9, 2019. Stay tuned for further updates. Will FX cancel or renew Pose for season two? The ratings have been pretty good (for an FX show) and it’s been getting quite a bit of attention so I think that Pose will be renewed. For now, I’ll keep an eye on the Nielsens and update this page with breaking developments. Subscribe for free Pose cancellation or renewal alerts. 7/12/18 update: FX Has renewed Pose for a second season. Details here. TV show ratings are still important. Follow Pose‘s weekly ups and downs. Find more Pose TV series news or other FX TV show news. What do you think? Are you glad that the Pose TV show has been renewed for season two? How would you feel if FX had cancelled this TV series, instead? Every time We have a show that reflects our LGBTQ status it doesn’t last. When will we be able to show our love and support?????? Oh my goodness, what an awesome show! I still watch the episodes over and over, on Xfinity’s On Demand. The writers are excellent, the actors are super impressive and Billy Porter, is my favorite; due to his flawless acting / timing and his magnificent singing voice. Pray Tell, let Donny Hathaway, have it!! Now, don’t get it twisted, Blanca sho-nuff went Home! Whoever, selects the music for each scene, is off the chain, they nail it every time, and The Ballroom music brings back wonderful memories for me! Wonderful, wonderful show! If, it cancels, Imma hurt somebody! LOVE POSE! I hope they don’t get rid of POSE I feel it’s a good sight on the gay and transgender community and they trials and tribulations they experience in the LBGTQ community especially an the era when HIV and AIDS was so high. I agree, love the tremendous talent of all the actors, finally something on television that has great writing, directing and a group of wonderful actors, looking forward— hopefully to another season!